Journal of Nanjing Agricultural University, 2019, 42(2): 292-299. 王伟科, 宋吉玲, 闫静, 等. 秀珍菇转录组测序和初步分析[J]. 南京农业大学学报, 2019, 42(2): 292-299. Abstract: [Objectives] This paper aimed to understand the molecular mechanism of fruiting body formation of Pleurotus pulmonarius and provide theoretical basis for breeding high-quality, high-yield and stress-resistant varieties of P.pulmonarius. [Methods] In this study, on the basis of building high quality cDNA library of P.pulmonarius, the transcriptome of mycelium and fruiting body of P.pulmonarius was sequenced by illumina high-throughput sequencing technology. In addition, bioinformatics methods were used to study gene expression profiles and predict functional genes. [Results] It showed that 81 693 UniGenes were obtained through sequence splicing and 61 306 UniGenes were annotated through NR database by BLAST comparison. By statistical species distribution, P.pulmonarius transcriptome had the most similar UniGenes to Pleurotus ostreatus. Meanwhile, a total number of 14 315 UniGenes were identified by annotating and forecasting the biological pathways for the transcriptome of P.pulmonarius. 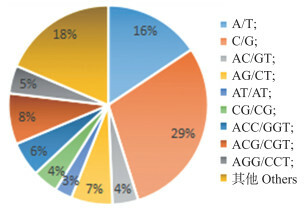 Among 14 315 UniGenes, parts of their biological functions were related to carbohydrate metabolism(1 683), amino acid metabolism(1 241), signal transduction(1 243) and translation(1 372). It was noted that these UniGenes enriched in afore-mentioned pathway might play a very important role in the process of fruiting body formation of P.pulmonarius. 10 967 C/T and 10 683 A/G conversion, 2 102 A/C transversion were found by SNP analysis. Meanwhile, 7 574 SSR in 81 693 UniGenes were found which took 9.27% of the total number of UniGenes. The characteristic of SSR distribution showed that mono-nucleotide repeat was the highest, which was 45.14% of the total, followed by tri-nucleotide repeat, which was 31.94%. 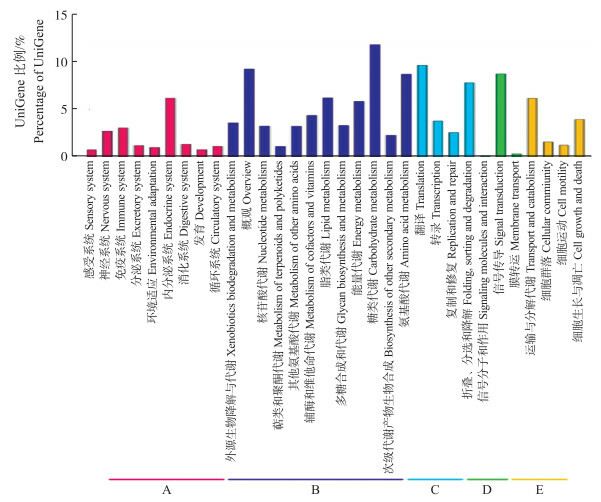 [Conclusions] The transcription group data were obtained of the mycelium and fruiting body of P.pulmonarius by high-throughput sequencing technology. Combined bioinformatics analysis, this study laid the foundation for analysing the genetic diversity, constructing genetic linkage map, and researching the differentially expressed genes and its functions at different developmental phases of P.pulmonarius. 图 1 秀珍菇4个样品RNA电泳图 Fig. 1 RNA samples of P. pulmonarius detected by electrophoresis M:DNA marker. 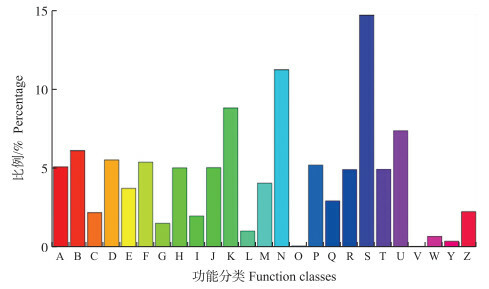 图 5 秀珍菇UniGene的KOG分类 Fig. 5 KOG functional classes for P. pulmonarius A.RNA加工和修饰RNA processing and modification; B.能量产生和转化Energy generation and transformation; C.染色质结构和动力学Chromatin structure and kinetics; D.氨基酸转运和代谢Amino acid transport and metabolism; E.细胞周期控制、细胞分裂、染色体分离Cell cycle control, cell division, chromosome segregation; F.糖类转运和代谢Carbohydrate transport and metabolism; G.核酸转运和代谢Nucleic acid transport and metabolism; H.脂类转运和代谢Lipid transport and metabolism; I.辅酶转运和代谢Coenzyme transport and metabolism; J.转录Transcription; K.翻译、核糖体结构和发生Translate, ribosome structure and occurrence; L.细胞壁/膜/包膜发生Cell wall/membrane/envelope occurrence; M.复制、重组和修复Replication, recombination and repair; N.翻译后修饰、蛋白质转化、伴侣Posttranslational modification, protein transformation, chaperone; O.细胞运动Cell movement; P.次生代谢物生物合成、转运和分解Secondary metabolite biosynthesis, transport and decomposition; Q.无机离子转运和代谢Inorganic ion transport and metabolism; R.未知功能Unknown function; S.一般功能预测General function prediction; T.胞内运输、分泌和泡内运输Intracellular transport, secretion and intra bubble transportation; U.信号传导机制Signal transduction mechanism; V.胞外结构Extracellular structure; W.防御机制Defense mechanism; Y.核酸结构Nucleic acid structure; Z.细胞骨架Cytoskeleton. 图 6 秀珍菇UniGene KEGG注释通路分类 Fig. 6 The classification of pathway annotated by KEGG for P. pulmonarius A.有机系统Organismal systems; B.代谢Metabolism; C.遗传信息处理Genetic information processing; D.环境信息处理Environmental information processing; E.细胞过程Cellular processes. 李碧琼, 陈政明, 林俊扬, 等. 秀珍菇S3-45菌株生物学特性研究[J]. 中国食用菌, 2017, 36(2): 13-16. Li B Q, Chen Z M, Lin J Y, et al. 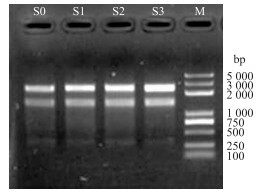 Study on the biological characteristics of Pleurotus geesteranus S3-45 strain[J]. Edible Fungi of China, 2017, 36(2): 13-16 (in Chinese with English abstract). 周烁红, 沈颖越, 蔡为明, 等. 肺形侧耳变温结实相关基因Ppcsl- 1的克隆及功能预测[J]. 菌物学报, 2016, 35(8): 946-955. Zhou S H, Shen Y Y, Cai W M, et al. Cloning and functional prediction of the Ppcsl- 1 related to change-temperature fruiting of Pleurotus pulmonarius[J]. Mycosystema, 2016, 35(8): 946-955 (in Chinese with English abstract). 刘靖宇, 江玉姬, 谢宝贵, 等. 草菇子实体不同成熟阶段的比较蛋白质组学分析[J]. 菌物学报, 2014, 33(1): 55-68. Liu J Y, Jiang Y J, Xie B G, et al. A comparative proteome analysis of Volvariella volvacea fruit-bodies developed at different stages[J]. Mycosystema, 2014, 33(1): 55-68 (in Chinese with English abstract). 王伟科, 袁卫东, 方献平, 等. 秀珍菇不同发育阶段蛋白质组学分析[J]. 浙江大学学报(农业与生命科学版), 2017, 43(5): 527-535. Wang W K, Yuan W D, Fang X P, et al. 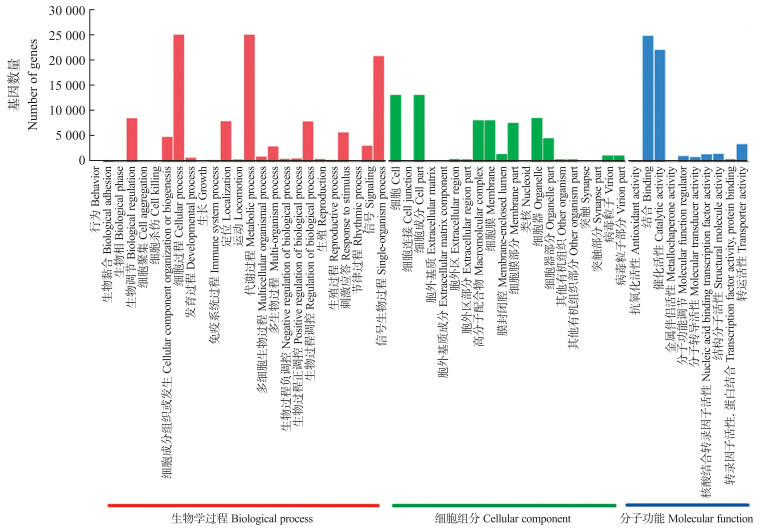 A comparative proteomics analysis of Pleurotus pulmonarius at different developmental phases[J]. 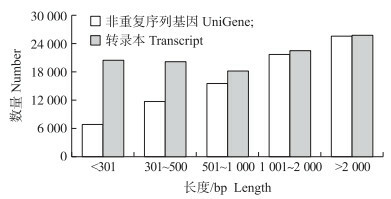 Journal of Zhejiang University(Agriculture and Life Sciences), 2017, 43(5): 527-535 (in Chinese with English abstract). 房学爽, 徐刚标. 表达序列标签技术及其应用[J]. 经济林研究, 2008, 26(2): 127-130. 祁云霞, 刘永斌, 荣威恒. 转录组研究新技术:RNA-Seq及其应用[J]. 遗传, 2011, 33(11): 1191-1202. Qi Y X, Liu Y B, Rong W H. RNA-Seq and its applications:a new technology for transcriptomics[J]. Hereditas, 2011, 33(11): 1191-1202 (in Chinese with English abstract). 李强, 陈诚, 熊川, 等. 杏鲍菇转录组数据SSR位点的生物信息学分析[J]. 应用与环境生物学报, 2017, 23(3): 454-458. Li Q, Chen C, Xiong C, et al. Bioinformatic analysis of simple sequence repeat(SSR)loci in the Pleurotus eryngii transcriptome[J]. Chinese Journal of Applied and Environmental Biology, 2017, 23(3): 454-458 (in Chinese with English abstract). 王伟科, 周祖法, 陈青, 等. 灰树花菌丝体与原基转录组差异表达分析[J]. 上海交通大学学报(农业科学版), 2016, 34(1): 74-80. Quevillon E, Silventoinen V, Pillai S, et al. InterProScan:protein domains identifier[J]. Nucleic Acids Res, 2005, 6(33): 116-120.
van der Auwera G A, Carneiro M O, Hartl C, et al. From FastQ data to high confidence variant calls:the genome analysis toolkit best practices pipeline[J]. Current Protocols in Bioinformatics, 2014, 11(1110): 1-43. 周雁, 范秀芝, 陈连福, 等. SSR在黑木耳和毛木耳转录组中的分布和序列特征[J]. 菌物学报, 2014, 33(2): 280-288. Zhou Y, Fan X Z, Chen L F, et al. Distribution and sequence characteristics of SSR in the transcriptomes of Auricularia auricula-judae and Auricularia polytricha[J]. Mycosystema, 2014, 33(2): 280-288 (in Chinese with English abstract). 刘伟, 蔡英丽, 何培新, 等. 粗柄羊肚菌转录组的SSR分布和序列特征分析[J]. 轻工学报, 2017, 32(2): 33-39. 王冲, 周惜时, 夏妍, 等. 铜胁迫下黄花月见草根系蛋白质组学分析[J]. 南京农业大学学报, 2016, 39(5): 754-762.